For starters I decided to do a turnip and spinach soup and my side dish was mushrooms with spinach and gruyere. For my main course I chose hake and after such a healthy starter and main course, a decadent dessert was in order. 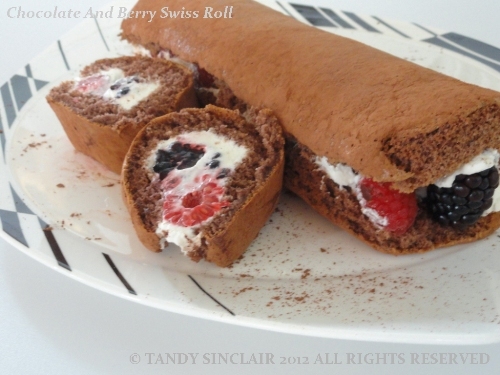 I made a Swiss roll that has me thinking about other options with the base. Raspberries and blackberries were on special and so I bought a punnet of each, knowing the colours would be great in contrast to the chocolate base, and whipped cream centre. I love swiss roll. Haven’t made a chocolate version for eons. Oh, I do love chocolate roll!